The standard Swift valve train uses cam lifts and cam angles of IN:240/8.5 and EX:232/8.1 respectively for both Intake and Exhaust and an outer shim design. TODA Racing has re-designed the valve lifter (bucket), shim (Inner-shim), valve spring and retainer. This enables the valve train system to safely use both larger lifts and angles than that of the standard system. 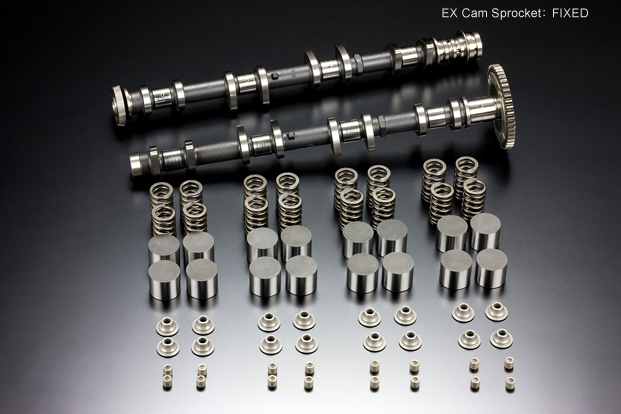 As to costs, in order to keep costs down but the quality up, we re-profile cams, which does not affect the performance. Through this process, we have been able to design 4 intake profiles with cam lifts from 9.5mm to 9.7mm and 3 exhaust profiles with cam lifts from 8.9mm to 9.1mm with varying cam angles for both the intake and exhaust. TODA M16A camshafts require the use of TODA M16A Inner-Shim KIT due to the different size of base circle. *Re-profiled: Trade-in of original camshafts is required. (valve lift) Please select from the profile list below. Please select from the profile list below. These camshafts are re-profiled camshafts (base circle diameter: Ø34mm) from Suzuki genuine parts. The original camshafts need to be provided by customer (new camshats preferred). Please contact us in case it is difficult to get the original camshafts. Since the base circle is changed, the standard buckets and the standard springs cannot be used. 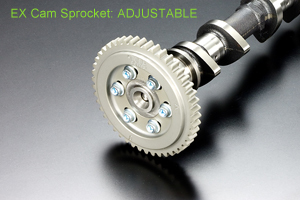 EX camshaft with original fixed cam sprocket has a center cam angles of 105 deg. When you order, please inform us if the camshfts is for ZC32S or ZC31S. These camshaft are not campatible. A default size shims are included. Other size shims are available on request. We also offer the camshaft re-profiling service only at the following price. Part No. ending with G** is for exhaust camshafts with an adjustable exhaust cam sprocket (sprocket is included). Part No. ending with 0** is for exhaust camshafts with the original fixed cam sprocket. Valve timing is based on the standard engine timing.